Above is data from a GM-10 detector. This graph is exactly what you'd see if you were running the Rad software on your computer, with a GM-10 connected. Each reading is timestamped (if desired). You can also buffer up to several days of readings, we've set this one to less, to make the graph a little more clear to read. 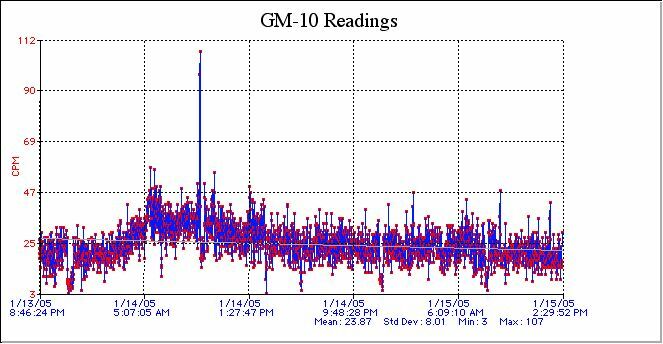 We've added the capability to the GM-10 software to automatically create and upload data graphs (in jpg, png, or bmp format) to your web site, on a periodic basis, so you're able to put your GM-10 online! As you can see, the CPM varies, due to the random process of nuclear decay. At these low counting rates, very large deviations in CPM are observed. For example, for a counting rate of 16 CPM, we would expect one standard deviation (sigma) to be SQRT(16)=4. The typical peak to peak variation is +/-3 sigma, or +/-12 CPM. So a range of readings from 4 to 28 CPM would be entirely normal! Indeed, this only covers the 99.7% probability range, so it would still be possible to see rare excursions past this range. In the above graph, data is being averaged over 5 minutes per reading, so we would expect to see the standard deviation divided by sqt(5), or slightly less than half the one minute values. 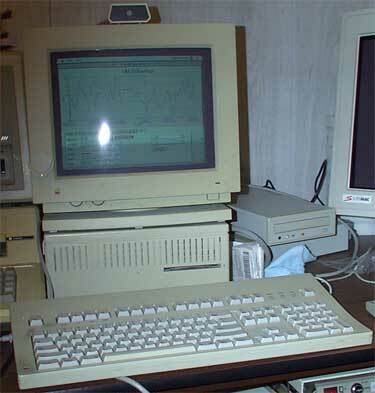 Pictured below is the setup in our lab. It consists of an old computer. The GM-10 is sitting on top of the monitor. The Rad software automatically uploads an image of the graph about every ten minutes to our web server, the image you see above.